Phone interviews. They can be one of the very first steps in the hiring process. After you’ve received that initial round of submissions and weeded through the pile of hopeful candidates, it’s time to get the most impressive applicants on the phone for a one-on-one conversation. You already know that most job hunters dread phone interviews. But, as the person on the hiring end of the phone, you probably dislike them just as much. When you need to talk to numerous applicants, these talks take a significant chunk of time out of your day. Plus, with struggles ranging from phone connection issues and poor call quality to the inability to pick up on those crucial nonverbal cues, phone interviews can be frustrating and awkward at best. However, love ‘em or hate ‘em, they’re an undeniably important step to help you narrow the playing field. And, if you have to do these phone calls anyway, you want to make the most of those conversations. One of the best ways to extract the most value from your phone interviews is by making sure that you ask insightful, thought-provoking questions. So, our recruiters have rounded up five key questions that you should ask in every single phone interview to help you find the very best candidates for your team. With resume in hand, you already have a decent sense of this particular applicant’s professional history. However, there’s one thing you won’t find in those perfectly quantified bullet points—why exactly this person is searching for a new position. According to Gibran Anthony, CPA, CGA, Senior Search Consultant at The Mason Group, this question should be the very first you ask when conducting a phone interview. “Although seemingly simple and straightforward, it’s a tricky question to help you scratch the surface and read between the lines of your interviewee’s answers to get to the true drivers behind why the candidate wants to make a career move,” he explains. Anthony warns that most interviewees will give you politically correct answers. However, to get them to open up—particularly over the phone—try using yourself as an example to make the question more approachable. The important thing to remember is that knowing why a candidate is looking for a new job is key in making a successful hire. Yes, you want to know why a candidate is searching for a new role in general. But, you also want to dig in deeper to discover what drew him or her to this particular job. This question is helpful at the phone interview stage, because it can give you a really great sense of an applicant’s motivations in just a couple of words. Is he unable to provide a clear answer to the question? That could be an indicator that he’s simply scrambling to find any sort of employment or escape his current position. However, if the interviewee’s answer details numerous specifics of the job or company that excite him, that demonstrates that he’s done his research and is chasing a role he’s passionate about—and not just a paycheck. While it might not be something that initially crosses your mind, you can learn a lot about a candidate by inquiring about previous performance reviews. After all, finding out what past employers thought about an employee’s performance is typically a good indicator of what you should expect. If the candidate does manage to respond to this question with a comprehensive answer, you’ll get some great insight into where the applicant excels, as well as where there’s some room for improvement. For example, a candidate may say that he always meets his deadlines and has been told he’s a great team player. But, in order to really move forward in his career, he might consider taking additional management courses to help him grow his leadership skills. Additionally, a high quality answer to this question indicates that the applicant is has come from a company that often conducts regular performance reviews. Knowing what type of work environment an applicant is used to (and thrives in!) can be helpful in order to identify the best fit for your own culture. When you’re so used to being on the hiring end of a phone interview, it’s all too easy to get wrapped up in trying to find the very best fit for your company. However, it’s important to remember that the candidate is trying to do that very same thing—find the organization that best suits his or her wants and needs. This question is an effective way to get on the same page about what you’re both looking for. The applicant was already able to get clued in about what you’re ultimately searching for by combing through the job description. But, asking this question is your opportunity to find out what qualities the candidate values in his or her employer. Does she thrive in a more relaxed environment with open-door communication? Or, does she rely on the structure and formal hierarchy of a more corporate workplace? Cultural fit is incredibly important to make a successful hire, and this brief question is your first step to ensuring a mutually beneficial fit for the both of you. Yes, this question can often be enough to cause job seekers to break out in a cold sweat. But, regardless, it can be a particularly revealing prompt for you to initiate in a phone interview. “With this question, you can see if the candidate has a clear vision for him or herself and confirm that he or she’s not just after the job,” explains Goodwin, “It also helps you to see if the candidate is thinking about staying long-term at your company and has outlined a plan for growth and career development.” An employee’s ultimate career goals are important for you to be in the loop on, as they set the scene for a more positive relationship from the very start. 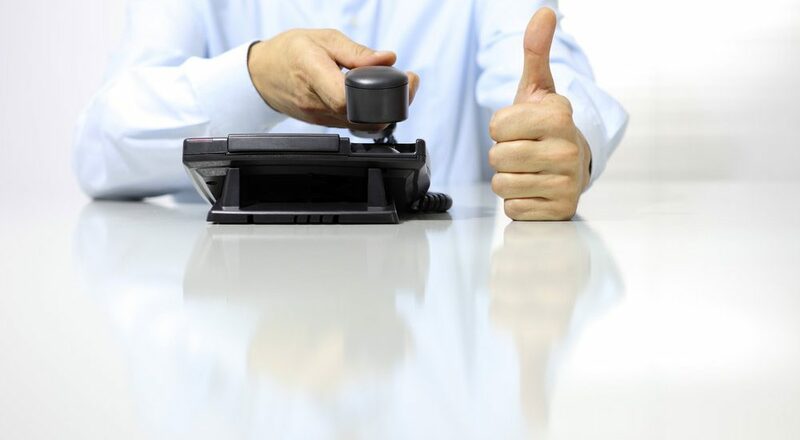 Phone interviews are a necessary part of the hiring process, but that doesn’t necessarily make them easy or fun. However, whether you love them or dread them, the purpose remains the same—you need to make the most of that time in order to weed through all of the noise and focus on the candidates that are the best fit for your organization. Currently hiring? Contact any of our offices today to speak to one of our consultants about your staffing needs and learn more about working together.